It’s October! The month starts out innocently enough, with colorful leaves and a breeze that’s just a little cooler than September’s. It lulls you into thinking October is nothing more than a time of quiet after the chaos and heat of September. But wait . . . the breeze will bite you soon enough, ripping those pretty leaves from their branches. As October builds, the veil between worlds thins, and you never quite know what is real and what is more than real. For the last couple of weeks, I’ve been watching shows on haunted houses, and I realized something. I don’t hate horror and fright. 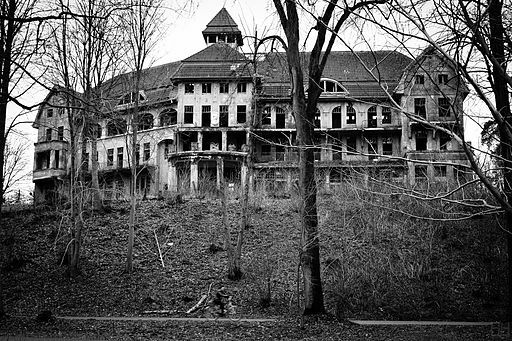 But I dread haunted houses, because every one I’ve ever seen has relied on cheap thrills rather than real, spine-tingling horror. The kind of horror that leaves you craving well-lit spaces and mindless chatter. The kind that makes you question what you thought you knew about reality. So of course, I started thinking about the type of haunted house I would design, if I had unlimited time and resources. I’ve been thinking about this quite a bit, actually. Most haunted houses have a theme, but that’s not the same as telling a story. I want to walk through an old mansion where something happened. I want to hear its history – or a more interesting version of its history, perhaps. I want to figure out the mystery as I go through the attraction. Maybe the ghost of a young woman haunts the attic, where she waits for her lover. (It’s not original, but it’s a start. It’s a story that tugs at our hearts, even though we know how it ends.) Of course, he never comes – but why not? Maybe he was waylaid on his way, one fateful night, by the girl’s protective, sinister father. Or the jealous suitor she rejected – or the one who never had the courage to court her. Maybe she simply wasted away in this attic, until one night she thought she saw him riding toward her, and she jumped, certain he would catch her – except that what she saw was nothing more than his ghost. Throughout the house, instead of relying on startles and gore, you would see shadows and hear far-off voices. Some of it would be illusion, of course. But did that door just move? Or maybe the haunted house would reverse roles – making guests the ghosts who weave, barely noticed, through the reality of the ghostly world. Blum House Entertainment in Los Angeles is doing something similar to what I have in mind – an immersive, interactive theater experience called The Purge: Fear the Night, in which you are thrust into a situation and your choices affect the outcome of the story. If you’re in the L.A. area, check it out and let me know what it’s like! The Purge is close to what I have in mind, but it’s not quite right. Throughout the experience, you know it’s theater. You don’t leave the event questioning what you thought you knew to be true. That is really the experience I’m after. Do you know if any haunted house that fits the description? Share in the comments. « Yardless Yard Haunt – Attack of the Styrofoam!